New Commissioner of Education Candice McQueen sent a message to teachers today. In it, she noted that she is a Tennessean (from Clarksville) and that she has years of classroom teaching experience, including teaching in Tennessee. These two items differentiate her from her predecessor. I wanted to send you a brief note during this holiday season to express how much I look forward to working with you in the months ahead. I am honored Governor Haslam has asked me to serve as Commissioner of Education, and I am pleased I will have the opportunity to listen, learn, and work with you in support of the children and families of Tennessee. This is a very exciting time in our state. We know we are headed in the right direction. We are the fastest improving state in the nation in student achievement. Most importantly, thanks to you, we are making a real difference in the lives of our children and the future of our state. I also know you share my belief that we have more work to do. We want every child in our state to have access to a great school and to great teaching in every classroom. We want every graduate to be college and career-ready so they can succeed in the future. We want Tennessee to continue to set the pace and lead the nation in the reforms and innovations that are making a real difference in the lives of our students. We will do that by supporting strong school leaders and great teachers, like you, in every school in our state and by staying focused on high standards and assessments that align with and work with those standards. I grew up in Clarksville, and like you have served as a classroom teacher – in both public and private schools – at the elementary and middle school levels — in Tennessee and outside our state – and I have spent most of my career focused on developing and supporting educators to help our students succeed. We both know that’s where the magic and hard work takes place – in classrooms – between great teachers and eager children. Now I look forward to traveling our state to listen and learn from you and other teachers, principals, parents, and other school leaders who are working so hard every day to help our children succeed. I can commit to you that I will always put children first in making decisions about policy or practice. Every decision we will make at the department will be made through the lens of what is best for our students. We know this work is hard, but if we continue to put students at the center of the conversation I am confident we can build on our progress. The future of our state – and of our children – depends on the work we will do together in the coming months and years. I’m excited to get started, and I look forward to working closely with you. Thank you for your leadership, and best wishes during this holiday season. Though she didn’t make it to the Final Four in Education Commissioner Madness, Lipscomb University Senior Vice President Candice McQueen looks to be Governor Haslam’s choice to serve as Tennessee’s next Commissioner of Education. This according to Joey Garrison at the The Tennessean. In addition to serving as Senior Vice President at Lipscomb, McQueen is the Dean of the College of Education at the school. Dr. Candice McQueen was appointed as a Senior Vice President at Lipscomb University in January 2014 where she also serves as the Dean of the College of Education. In her new senior role, McQueen serves on the executive leadership team of the university and oversees both her college and the 1,300 Pre-K-12th grade students in three schools at Lipscomb Academy – the largest private school in middle Tennessee. McQueen’s college and teacher preparation programs have been highlighted at both the state and national levels for excellence in both teacher preparation design and teacher candidate outcomes. The programs in McQueen’s college have been consistently highlighted as one of the top teacher training programs in the state of Tennessee for quality and effectiveness based on the Tennessee Report Card on the Effectiveness of Teacher Training Programs and was most recently pointed out as the second highest ranking program in the nation by the National Council on Teacher Quality. In addition, in her six years as dean, the college has grown by 54% with 72% growth at the graduate level while adding 15 new graduate programs, including a doctorate, and creating innovative partnerships that focus on collaborative design and delivery for coursework and programming. In 2012, McQueen and the College of Education partnered with the Ayers Foundation to initiate The Ayers Institute for Teacher Learning and Innovation. The institute has a focus on supporting higher academic standards, embedded professional learning and new approaches to leadership training and support. The institute initially partnered with the Tennessee Higher Education Commission to create pre-service teacher resources and web-based videos on teachers modeling the usage of college and career readiness standards. Tennessee’s higher education institutions and alternative preparation programs are currently utilizing the resources to prepare new teachers and leaders. Also, many Tennessee school districts and other states are using the resources for professional development. In addition, the institute’s innovative MOOCs (massive open online courses) in teacher preparation were recently released. The first three MOOCs released in September and October 2014 already have almost 10,000 users. Before coming to Lipscomb and serving as a department chair, Dr. McQueen taught in both private and public elementary and middle schools where she was awarded multiple awards for both her teaching and the curriculum design of a new magnet school. Dr. McQueen has a bachelor’s degree from Lipscomb, a master’s degree from Vanderbilt, and a Ph.D. from the University of Texas. McQueen has been a strong supporter of Common Core, testifying before state legislators on the issue. She also spoke about the standards and their importance at Governor Haslam’s Education Summit held earlier this year. We look forward to working with Dr. McQueen on critical education issues facing Tennessee Educators. Dr. Candice McQueen is well versed in the hard work teachers’ face every day as she has taught in both private and public elementary and middle schools. She is familiar with Tennessee, one of our major concerns. “We have admired Dr. McQueen’s work from afar, and are looking forward to working with her more closely,” said Executive Director J. C. Bowman. Priorities for a new commissioner must first be student-centered. Our students must have the resources and innovative instruction to compete in a world-class economy right here in Tennessee. We are reminded that the working conditions of our educators become the learning environment of our students, therefore teachers must also be a high priority in the new commissioner’s agenda. Finally, Tennessee will need to continue to allocate resources devoted to the transition of standards. As we have maintained, we believe it is time to move beyond the Common Core debate. We need to continuously build state specific standards that are challenging and meet the needs of Tennesseans. This needs to be done with legislative input and with the involvement of Tennessee educators. In this season of hope, we truly look forward to working with Dr. McQueen to move our state forward. The Nashville Area Chamber of Commerce released its annual Report Card on Metro Schools yesterday. The group made 5 policy recommendations, including asking the MNPS School Board to wait until after the new Mayor is elected in August of 2015 before finalizing a Director of Schools. The Nashville Chamber’s Education Report Card Committee should annually monitor the implementation of MNPS’ strategic plan through 2018. MNPS’ pay supplement system should be reformed to financially reward teachers who assume a leadership position at their school. MNPS should highlight issues which impede school-level autonomy to identify needed policy or statute changes. The Metro Nashville Board of Education should take action to recommit itself to policy governance and professional development in order to establish steps toward developing consensus moving forward. The school board should hire a new director of schools after the election of a new mayor in 2015. The Metro Nashville Education Association weighed-in on the Report Card, essentially agreeing with the core recommendations but adding that teacher input is needed going forward and that funding for teacher pay must be a priority. The MNEA agrees that a new Director should not be hired until the new mayor has been elected. In addition to the annual monitoring by the Chamber’s Report Card committee, the success of MNPS’ strategic plan, Education 2018, a plan to become the highest performing urban school district in the United States, will be dependent on the support of all of Nashville, especially its students, teachers, and leaders. MNEA has long supported more pay for teachers who assume leadership responsibilities. However, its implementation will be contingent upon the district making it a funding priority. Both nationally and internationally, highly success schools exist where there is teacher autonomy. Yet experience tells us that in the absence of an accountability structure and/or the will to create one, school-level, or principal autonomy, will lead to chaos and injustice. In 2002 the MNPS Board of Education adopted policy governance. No member of the current board served during 2002, nor did any member vote to adopt this form of governance. The current elected board should either recommit to policy governance or choose a form of governance that best serves their needs, and most importantly, best serves the needs of Nashville’s students. The hiring of the next MNPS Director of Schools should not occur without input from Nashville’s students, parents, teachers, and new mayor. Below is an interview with Justin Owen, President and CEO of Beacon Center of Tennessee. The Beacon Center is helping push voucher legislation in Tennessee. Some of our readers may not know much about the Beacon Center of Tennessee. Can you tell us about your organization? Most people refer to the Beacon Center as a “free market think tank,” but what that really means is that we come up with ideas to empower Tennessee to reclaim control of their lives, and we put those ideas into action so that those Tennesseans can freely pursue their version of the American Dream. During the past legislative session, your organization helped push a measure to create a voucher program in Tennessee. Are you bringing about the same legislation this year? Can you tell us about it? Beacon supported legislation last year that would provide a voucher, or opportunity scholarship, to low-income children zoned for districts containing failing schools. We believe that parents, not ZIP codes, should decide what school their child attends. We owe it to Tennessee families to ensure that each child in our state gets the best education, tailored to his or her unique needs, and we will support similar legislation to do just that in 2015. Many of our readers are public school teachers. Why should teachers be in favor of sending money away from public schools to private schools? Teachers consistently point to the need for higher per-pupil funding and smaller class sizes. Opportunity scholarships will give them both. As a recent Beacon study [http://www.beacontn.org/wp-content/uploads/fiscal-impacts_web.pdf] shows, only a portion of the amount we already spend would follow a child via a scholarship. The rest would remain with that public school to be reinvested in those children. Some districts – like Memphis and Nashville – would not only cover the fixed costs, but save an additional $1,300 to $1,500 for every child that leaves. And while there will be no mass exodus of children from the system (as most families will continue to choose the public school option for their children), those who do leave with a scholarship will reduce classroom sizes, allowing teacher to increase their focus on those who choose to stay in the school. Is using a voucher system been proven effective? Yes, studies show that both children who use vouchers and those who choose to remain in their public school benefit. Nine of 10 random assignment studies show gains among opportunity scholarship students. And of 23 studies conducted on vouchers’ impact of public school students, 22 found positive gains in their performance as well. Not one single study has ever found a negative impact on voucher students or those who remain in public schools. Thus, these programs represent a rising tide that lifts all boats. Besides vouchers, what other education initiations does the Beacon Center promote? Beacon sees opportunity scholarships as another tool in the education toolbox, and part of a broader movement to empower parents with more choice in education. Our focus is on advancing the various options parents have at their fingertips. The announcement by Governor Bill Haslam addressing testing, evaluations, local control and teacher input was a much needed statement, as Tennessee is heading into the 2015 legislative session. Keeping in mind that each branch of government has a distinct and separate role, it is appropriate for Governor Haslam to identify changing priorities. As always, the key is in implementation of policies. Many policies sound good. They simply have to be executed correctly. It is always good to step back and put some political philosophy behind the policy. However, the real message educators need to hear from elected leaders is that they are trusted. We need to start a fresh conversation on evaluating how we assess our educators, which may mean a change in the way we measure engagement. When did test results became the be-all and end-all of our education experience? Is standardized testing so reliable that it has ended the search for something better to determine the quality of our education experience? And while numbers may help us understand our world, we recognize that they do not tell us the entire story. Most local school districts understand that ability of their instructional personnel is the only real differentiator between them and other local districts. Therefore, it is imperative that we start treating our educators like one of our most important assets. And it is only common sense that one of the key items policymakers need to address in 2015 will be teacher salaries. However, educators do not enter this field of public education for the income; they are there for the outcomes. If the perception within Tennessee is that teaching is not a celebrated profession, we certainly will not get the young talented people to pursue a career in public education as a profession. We have steadfastly maintained that requiring school districts to simultaneously implement new standards, new teacher evaluations and perhaps a new curriculum, as well as new testing demands, will continue to place enormous pressure at the local level. More information and feedback on state assessments to help teachers improve student achievement is a welcome addition to the discussion. The use and/or overuse of testing remain a conversation worthy of public debate. Tennessee will need to continue allocate resources devoted to the transition of standards. As we have argued, we believe it is time to move beyond the Common Core debate. We need to continuously build state specific standards that are challenging and meet the needs of Tennesseans. This needs to be done with legislative input and with the involvement of Tennessee educators. The key item we took away from Governor Haslam’s latest proposal is his willingness to hear teacher concerns. It has taken us a long time to get to that point. However, it was a welcome relief to many educators, as we are now positioned to reset the dialogue. The area of improved teacher communication and collaboration has long been needed. We hope a new commissioner of education will truly embrace this concept. If the right people are brought together for the right purpose, we believe anything is possible for Tennessee children and those who choose to educate our students. Dreaming big should not be just for the children in our classrooms, it should be for the stakeholders and policymakers in our state as well. The Tennessee Education Association and Metro Nashville Education Association issued a joint statement on the takeover of Neely’s Bend Middle School by the Tennessee Achievement School District (ASD). “The state takeover model has proven to be an ineffective solution for struggling schools. Schools in the Achievement School District in Memphis on average are doing no better or worse than before the takeover. The ASD method of ‘do less with more’ is already harming our students in Memphis. Increasing its presence in Nashville is irresponsible and reckless. “Nashville students, teachers and schools need support and resources from the state, not a heavy-handed, unwanted takeover of one of our community schools. Neely’s Bend parents and teachers made it very clear at the Dec. 4 ASD meeting that they believe in their students, their school and their community. “Just this week Governor Haslam spoke of the need for greater local control and decision making in public education. This must extend beyond teacher evaluations to decisions about how to improve struggling schools. The ASD and its charter operators do not know this community. Strangers do not understand what this school needs more than the students, parents and educators who make up the Neely’s Bend family. “Instead of continuing to funnel money into a program that has failed to deliver on its promises, the state should instead invest that money in struggling public schools to allow educators and parents to determine how to improve public education for their students. Below is an interview with Achievement School District’s Superintendent Chris Barbic. Please note that this interview took place before the announcement of Neely’s Bend as the school that the ASD will take over. 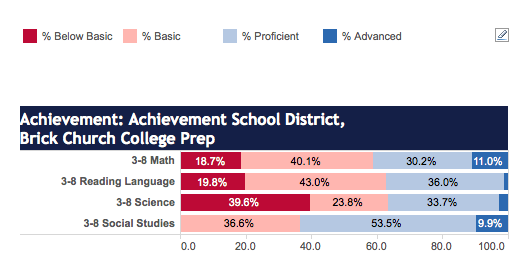 In your view, how is the Achievement School District doing overall? We are basically in our third year of having schools in the system. Our first year is really just the planning year. There are a lot of ways to answer that question. The short answer is we are certainly seeing schools that are making really strong gains. If you look at our schools last year, that finished their second year, that’s our oldest cohort of schools we have. If you look at those six schools, there is a group that averages about 6 point gains composite. If you just look at the charter schools, the three charter schools, they average about 11 point gains, which is that double digit gains that we like to talk about and we like to see. Three of our charter schools who are in the second year, last year, were level five growth. Two of the three made if off the priority list in just two years time. I know there are lots of people that want to be quick to judge on how we are doing, I think what’s important for people to remember is that of the 17 schools that we have last year, two-thirds were in their very first year. I think it’s a little quick to judge on the entire body of work because the vast majority of schools last year were in their first year. So when you look at our second year schools, you are seeing lots of promising signs, especially our charter schools, are doing well. On the flip side, there is certainly room to improve. We are trying to come at this with the appropriate level of humility. The schools that we are going into, there were lots of teachers, principals, and dedicated folks who cared a lot about the kids. Unfortunately, that didn’t translate into the progress and gains that we wanted to see. We understand that this is not easy work. We really try and highlight that this isn’t about a one principal or a group of teachers, what we are really trying to highlight is that this is about how you build a new type of system. When I took this job, the charge was to build a school district from scratch. The first thing anybody would do would be to look around and find who was doing this well. We wanted to model ourselves off a large or medium urban school district. If you look around the country, to see who the districts are that we want to build ourselves after, there wasn’t one example we could point to. There wasn’t one urban district in the country that was getting it done with all kids. I think when you can’t point to one example, that says to me it’s a systemic problem.There is a problem with how the system is set up. We tried to take advantage of the opportunity to build a new type of school system. Trying to reform an existing school district that was structured and set up almost a hundred years ago, it’s trying to make a model T work better. It’s an outdated system. What we are trying to put forth is how do we build a car for the 21st century? How to build a car for 2015? How do you build a district that is more aligned with things that we know work in schools around finding great educators and giving them economies and putting resources down in the building level and not a top down bureaucracy that mandates excellence, but an organization that bottom ups and tries to release excellence. That’s the organization that we are trying to build and why we have chosen to partner with high performing charter organizations to do the work. What do you think about all the parental feedback that you received from the meetings at Madison and Neely’s Bend? Unfortunately, we did not hear enough of it. I think the purpose of those meetings was to hear from parents. I think instead what happened was we heard from a few parents. A lot of the people in the meeting were folks that either weren’t from the school community at all or were elected officials that unfortunately chose to put information out there that was, at best, misleading. It wasn’t really until after the meeting was over that we got to really sit down and talk to parents. Fortunately for us, beside the parent meeting, one of the things we have done in the community is that we had a team of folks out knocking on doors and block walking. The weekend leading up to the parent meeting, they knocked on all the fourth graders doors in the elementary schools that cede into Neely’s Bend and Madison. That’s really the group of kids that are going to be impacted the most by this decision. LEAD will only be serving fifth grade next year. What we found was interesting. A lot of the parents, especially the ones that were the most engaging in their kid’s education, already decided that they were not going to send their kids to Madison or Neely’s Bend. They were already looking at other options to send their kids outside the neighborhood because of the reputation of the schools. Another group of parents that were a little less engaged and more open to the idea of what LEAD was proposing to do. But, had there not been this conversation about the dramatic change that could potentially happen at one of the schools, they were much more inclined not to send their kids to those schools either. The reason I bring this up is because we think there should be a great neighborhood option that kids and families can access that is right in their own backyard. They shouldn’t have to choose options outside of their community for them to go to a good school. If you look at most of the schools in the low-income parts of Nashville and Memphis, where we do most of our work, the fact is there aren’t enough good neighborhood options. If you look at kids in the priority list, two in ten of those kids can’t read. That’s just not an acceptable number on anyone’s measure. We can all debate data, but no one can agree that’s acceptable. I think there are a good number of parents who don’t understand and are skeptical about it. That’s understandable. This is new. This is a change. There are just as many parents, if not more, that are open and excited for a great school in their neighborhood. That’s all we are trying to do. To deliver a great school to kids in either Neely’s Bend or Madison because we believe that’s what they deserve. How does the ASD on the whole is dealing with literacy? If you look at our data, in our first year we saw growth in math and science. Our proficiency scores in reading dipped the first year. Last year we saw that trend reversed. We actually grew faster than the state average in reading and math last year if you look across all of our schools. That’s an important measure for us, most of our kids are behind grade level, and our kids need to catch up. If our kids aren’t growing faster than the state average, we are never going to close the gap. That’s an important number to look at. Last year, our kids grew faster than the state average and both middle, elementary, and high school. I think it gets to how we set up our organization. If you would ask someone in the district how they handle reading, they would tell you that we use XYZ program and the central office pushes that out to the schools to implement that program. Maybe there is some flexibility for teachers and schools to build things on their own, but it’s probably more that they don’t feel like they are getting supports form the central office and they are left to figure things out on their own. I think the way we approach that is that we believe that teachers and principals who are in schools closest to kids need to make the decisions that matter most in what academic programs should look like. We all have to teach the same standards. The standards are the standards. How we teach those standards should be up to the people that are closest to the kids. That’s the principals and teachers. Our whole philosophy is that we are not going to tell you which literacy program to use. We are not going to tell you how to teach literacy. What we are going to do is having a rigorous application process for you to get a charter with us. We are going to go through your academic program and we are going to look at your track record and results. Once you have been approved to open your school, we are going to let you make the decisions around curriculum that you think will be best for your kids. We are going to agree on some benchmarks for progress. We are then going to hold you accountable for results. We just believe that folks sitting in a central office are not the ones in the best positions to make decisions bout what’s best for kids. The people who are in the best position are folks in the classroom. I think too many times that we see these big top down bureaucracy that lots of decisions get made by people in the central office. Sometimes they get rolled out well. Sometimes they don’t. We don’t lean on people in the schools to make the decisions that matter most. I think that’s where these big top down traditional districts get it flat out wrong. It’s why we have tried to approach this in a different way. Do you think the decorum of the education debate is gone? We stopped listening to each other. I have been painted all sorts of ways in Twitter and Facebook. At the end of day, I taught for six years. I taught sixth grade in an elementary school. The whole reason why I got out of the classroom to start a middle school was because I was tired of watching my elementary school kids go off to local middle schools and have a terrible experience. I was listening to one horror story after another when my kids would come back to visit my classroom. It broke my heart. I can complain about the middle school, the system, or everything that’s not working, or I could try and do something about it. I chose to start a charter school that served kids in that neighborhood. It grew into a network of schools and thirteen years later I am taking a job and moving to Tennessee. I say all that because it’s not like anybody on either side of the debate woke up with horns growing out of their heads. Most of the people that are engaged in this debate and conversation genuinely care about kids and genuinely want to see schools get better. I think that when you see some of the misinformation that was spread at the meeting in the Nashville, like when the union passed out flyers. The ironic things about the flyers are that they said “Facts” and it had statements after it and there wasn’t one fact following the statements on that flyer. When I see that, I tend not to give the people the benefit of the doubt that they are doing this for kids. I think most people are. I think where people get hung up and where we start to fight is while we agree on the what. We want better schools. We disagree on the how. I think that’s okay because the debate is going to make us all better. We lose a lot when we stop listening to either other. You go to Twitter and each side puts something up that will benefit their side of the argument. Everyone yells in their little echo chambers. I think the other thing, which is unfortunate, is that we don’t come after this with the appropriate level of humility and recognizing that maybe not all of our answers are right. Maybe, there is actually some merit to what the other side has to say. I think until we are able to listen and agree that no one has a monopoly on good ideas, we are going to continue to lob on to each other. I don’t think that’s helpful. I tried to really reach out and talk to people on both sides of this thing. Sometimes I get fired up and passionate and that is what it is. That happened at the meeting last week. But I think we all have to do a better job of listening to each other. Giving each other the benefit of the doubt that we are coming at this with the same end goals and that is better schools. We have to keep talking about the how. Where people chanting at the meeting you were leading? Jill (Speering) tried to get a chant started. What was unfortunate was that there were parents trying to speak. It wasn’t even a parent in favor of the ASD being there. When you got school board members leading chants and shouting down parents who are trying to talk, it’s not helpful. None of us are evil people. We are all trying to do good work. I just think a little more decorum or a little more humility and willingness to listen to the other side would benefit all of us. I don’t know where things got off track. Maybe that started to happened before I even go here. It sure would be refreshing to try and get things back on track so we can have productive conversations about kids. Is there anything that is being overlooked in the current education debate? I do think, unfortunately, that we don’t talk nearly enough about kids. We also don’t talk about what works and what hasn’t. I don’t think we talk enough about our willingness to be innovative. Innovation can be reckless. We can’t run social experiments on children. That’s not what we are trying to do. But there is a place for innovation. If you time warp someone who was alive 100 years ago. Walked him through a normal day. Take him to the grocery store. They look different than they did 20 years ago, you can check yourself out now. Take him to an airport, or a bus stop, or any place that he would be used to a 100 year ago would look completely different. Except, if you took him into a school and it would look pretty much the same. There would be a hallway with classrooms, and the classroom will either be in rows or tables. We have whiteboard instead of chalkboards. By in large, they would probably feel most familiar walking through the halls of a school. That’s crazy. To think of all the technology and changes and advances that we have made as a society in the last 50 years. For that innovation to completely steer clear of most of what’s been happening education today, there’s a problem with that. There is not enough conversation about kids. There is not a conversation about what works and what doesn’t and how we innovate as a profession. Will the ASD have a bigger presence in Nashville? I think that you can’t ignore the fact that the number of priority schools in the city grew from 6 to 15. You can’t ignore the fact the number of kids attending priority schools in Nashville doubled within the last two years from 3,000 to 6,000. That’s a fact. If we can find partners like LEAD that are willing to do turnarounds in priority schools in Nashville and have a track record and the quality team we believe LEAD has, then yeah, we will expand and we will grow. We will only do it when we feel like we can partner with high performing organizations that will do good work. Assuming we can do that, then we plan to grow our presence here. Data between Neely’s Bend, Madison, and LEAD. The ASD recently announced Neely’s Bend as the school that will be converted into a charter school by LEAD. There is currently a data war going on between both sides. Because of that, I wanted to just provide data on both of these schools. I will literally copy and paste data from the state for to decide. Many people in this data debate always discuss the Proficient/Advanced students. I will discuss the Basic and Below Basic students who are falling behind. First, Neely’s Bend had 548 students last years. Madison had 756 student. The ASD picked the school with over 200 fewer students. This data shows that in Math, almost 74% of the school was Basic or Below Basic when it comes to Math. For reading, almost 76% of the school was Basic or Below Basic in Reading. For both of those tests, only a fourth of the population of the school was Proficient or Advanced. Looking at the same data for Madison, we see that 81% of the students are Basic or Below Basic in Math. As for Reading, 76% are Basic or Below Basic. Comparing the two schools, Madison has more students struggling with Math (7 percent more) and the same amount struggling with Reading. Around a fourth of students at this school is Proficient or Advanced in Reading and Math. When looking at TVAAS, we see the Neely’s Bend has an overall score of 1 and the rest of the scores were 2s. Madison also had an overall TVAAS score of 1, but we see higher TVAAS scores in Numeracy and Literacy/Numeracy and lower score in Literacy compared to Neely’s Bend. The ASD tells parents to look at the Brick Church College Prep because LEAD is currently converting a school there for the ASD. Below is the same information for Brick Church College Prep that I provided for the other schools. It should be noted the number of students is fewer (177) because they are converting one grade at a time. At Brick Church College Prep, almost 60% of the students are Basic or Below Basic in Math (compared to 81% at Madison and 74% at Neely’s Bend). 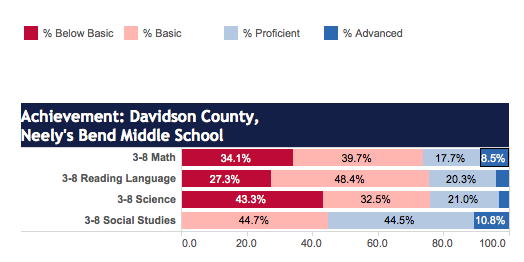 For Reading, almost 63% of the students are Basic or Below Basic (compared to 76% at Madison and Neely’s Bend). Brick Church College Prep had an overall TVAAS score of 5, higher than both Neely’s Bend and Madison. In education circles across the country, the word data is treated like a curse word. We need to use data in school systems to find out where our students are. It’s horrible that only a fourth of our students are proficient or advanced in Reading in Math at these schools. It’s not just Neely’s Bend and Madison where this is a problem. It’s all over, in both traditional and charter schools. The hardest part in being trained as a researcher is that you must put your personal opinions asides and look at the data. It’s hard because I have a lot of strong opinions. I know many people will tell me the data is off with Brick Church College Prep. But at this point, Brick Church College Prep is doing better when it comes to the tests we are giving our students. As a middle school teacher, I believe the changes that we need to complete should take place in elementary schools. In Metro Nashville Public Schools, we have changed the High Schools (academies) and the Middle Schools Preps. What we are lacking is the changes to the elementary schools. We have far too many students leaving elementary school behind. I strongly believe if we work to stop this in elementary schools, we can help our middle schools become stronger and stave off the take over from the ASD. As leadership changes take place at Metro Nashville Public Schools, I look for a new Director of Schools who can hit the ground running to help our elementary schools. The U.S. Department of Education has put forth a new plan to evaluate teacher prep programs. The new plan is about making sure teacher prep programs are producing quality teachers, not just a lot of new teachers. The biggest part of this new plan is allow more public information about the teacher prep programs. In Tennessee, this is already happening. Recently, the state of Tennessee released information on the state’s teacher prep programs. Employment outcomes: New teacher placement and three-year retention rates in high-need schools and in all schools. New teacher and employer feedback: Surveys on the effectiveness of preparation. Student learning outcomes: Impact of new teachers as measured by student growth, teacher evaluation, or both. Assurance of specialized accreditation or evidence that a program produces high-quality candidates. I think providing teacher and employer feedback for teacher preparation programs is great for a few reasons. If a teacher gets out of a program and finds that it was lacking, there should be a way to let others know the program is lacking. The same goes for school districts. If they are receiving top-notch teachers from a school, let others know! It also means that universities could gain or lose applicants to their universities based on their ranking. Especially for those teachers who want to go back to graduate school to further their education. The rankings from individual school could sway students to go else ware. Out of the five programs that are consistently outperforming other programs, only two of those come from traditional teacher training programs. I think it’s time for higher education programs to step up their game to produce only the best teachers. That’s the conclusion teacher Jon Alfuth draws about Governor Bill Haslam’s recently announced changes to teacher evaluation and support. Alfuth notes with frustration that Haslam appears happy to support teachers in ways that don’t involve any new money. Reducing the weight given TVAAS on a teacher’s evaluation, for example, doesn’t cost anything. Adding a few teachers to a “cabinet” to give feedback on tests is welcome change, but also doesn’t carry a price tag. While reducing the percentage from 25 to 15 percent achievement data for non-EOC teachers is a step in the right direction, I don’t feel that it goes far enough. I personally think it’s unfair to use test scores from courses not taught by a teacher in their evaluation given the concerns surrounding the reliability of these data systems overall. Consider the teacher salary discussion we’ve been having here in Tennessee. This is something that Tennessee Teachers have been clamoring for and which the governor promised but then went back on this past spring. There’s no mention of other initiatives that would require extra funding, such as BEP2.0, which would provide millions of additional dollars to our school districts across the state and do much to help teachers. There’s also no mention of expanding training Common Core trainng, which is essential if we’re going to continue to enable teachers to be successful when the three year phase in of growth scores winds down. In short, while the proposed changes are step forward, at least in the view of one teacher, much more can be done to truly support teachers and their students.